Download image from website is easy but it may not able to fit to the size as we want, with which some may appear to be too big and some too small. Instead of saving the original size to desktop and later use image editor to resize it, with Firefox add-on, ResizeR lets you skip all these hassle steps by resizing the image directly from the web. Once you are satisfied with the size, then only save it to your local drive. ResizeR is free and very useful tool that is able to resize the image either from web or local computer besides able to rotate the image. To use this feature for resizing image from web, just right click on any image on the web, then choose ResizeR Image from the context menu. Another tab will be launched and just key in the image size as you want, then click on ResizeR button and it will generate the image according to the size that you entered. If you would like the image to be rotated, then click image rotation link as shown immediate above of the ResizeR button, choose the rotation degree as you like and hit ResizeR button to generate the image according to what you have defined. Alternatively, to resize the image which is already being saved in your local computer, just click on Local tab and browse for the image file, adjust the image width and hit ResizeR button to start generating the image to the size as you have defined. Once you are satisfied with the size, right click on the image and choose Save Image As to save the file to local drive. The only drawback of ResizeR is it only support JPG format at this moment. Image files in other format like PNG, BMP, TIF, GIF are not able to be resized by using this service. 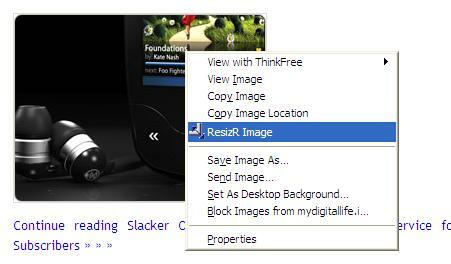 To install ResizeR 0.3 as Firefox extension, click here.